The title is a take on the best-selling Lance Armstrong book It's Not About the Bike which, given the doping allegations that just won't go away, is increasingly becoming the most accurate title for any book, ever. Penn's title is no less accurate. His book – and Ride of My Life (there's a film clip below), the BBC4 documentary he made off the back of it – is dedicated 100% to the bike. But not just any old bike: it's all about the author's quest for his Perfect Bike. Penn travels the world in search of the perfect components – each individually researched and selected – for his dream bike. Wheels from California, forks from Columbus in Milan, headset from "the arse-end of a large industrial estate in north-west Portland", steel frame from Brian Rourke Cycles in Stoke-on-Trent ... and on it goes. It's all interwoven with a history of the bicycle (and, by extension, a history of cycling), as well as the stories of bespoke bicycle makers, craftsmen, designers and engineers who make the best bike bits in the world. Make no mistake, this is a book for bike geeks, with diagrams scattered throughout: a sketch illustrating the geometry of a frame; another explaining the fork rate or 'offset' ("the perpendicular distance between the steering axis and the centre of the wheel"). But it's not so geeky as to alienate readers (cyclists and non-cyclists) who don't know a hub from a headset and who, quite frankly, aren't interested in finding out. There's enough here, beautifully written and seemlessly bolted together, to have broader appeal, especially given the inclusion of Penn's own modestly recounted cycling tales (Penn rode round-the-world before it was possible to blog about it). Penn proves that when it comes to finding happiness on two wheels, sometimes it really is all about the bike. 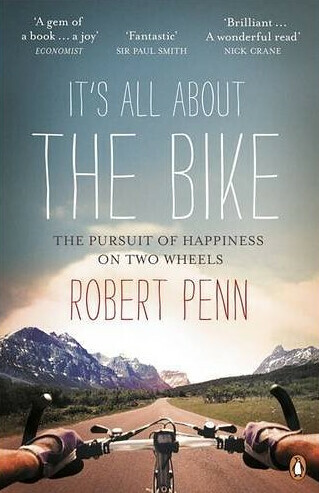 It's All About the Bike: The Pursuit of Happiness on Two Wheels is published in the UK by Penguin Books, and in the United States by Bloomsbury.